SFG’s team of the tournament. The title of Best African Goalkeeper has the ups and downs of an aggressive merry-go-round. When Enyeama shut-out the world’s best at the 2010 World Cup, most placed him at the top of the African goalkeeping food chain. But he was starved of action at Lille and forged a forgotten figure on the continental stage. Two and a half years later, Enyeama found a familiar stage at the Cup of Nations. He was back in South Africa and playing better than ever. Captain Vincent picked up a CAF Team of the Tournament award and conceded just four goals on the road to the title. Efe Ambrose produced the unselfish front that characterized the team spirit of the Nigerian Super Eagles. Deployed in a secondary position as a right full-back, Ambrose provided the defensive solidity to shield young centre-backs Omeruo and Oboabona, but also the attacking know-how to feed the likes of Moses, Ideye and Musa. Keshi can’t have asked for much more from the Celtic defender. The colossal Wolverine-like defender was captain personified as Cape Verde eclipsed their just-happy-to-be-here expectations and reached the knockout stages on their Afcon debut. He regularly barked out orders to his fellow defenders and carefully placed the midfielders in front of him like a Soviet chess grandmaster, and was always willing to put his body on the line to make goal-saving blocks. Cape Verde’s biggest headache will be how to replace the 32-year-old following his retirement from international football, for Neves is the type of defender who transforms a decent defence into a very good one. Part of an excellent defence which went 493 minutes without conceding from open play and was the main reason why Burkina Faso reached the final, Koulibaly was at times rugged but also showed moments of great composure when in the line of fire. He was terrific in the quarter-final against Togo when he had the unenviable task of marking Emmanuel Adebayor as well as dealing with the break-necking pace of Serge Gakpe and Floyd Ayite, shuffling to the flanks to nullify their threat. Is it a bird? Is it a plane? No, it’s Adama Tamboura running down the wing! Another year, another appearance in the SFG Cup of Nations team of the tournament. The stern-shouldered left-back loves incessant sojourns into opposition territory – even when the game is petering out in extra-time, as South Africa found out in the quarter finals – but, remarkably, is still able to keep up with his defensive duties for the duration of games; his pace compensating for his high positioning. In a Mali side that struggles for creative intelligence, Tamboura assumes the role of the playmaking left-back with his raids down the left and contributed two assists of his own. He remains a polarising figure but John Obi Mikel was, all things considered (consistency, mainly), the player of the tournament. While his commitment to the cause been questioned in the past, the Chelsea defensive midfielder’s importance to the Super Eagles is unquestionable in terms of establishing the equilibrium between defence and attack. Entrusted to be more expressive by coach Stephen Keshi, Mikel has shown the traces of panache on the ball which saw him named as one of the outstanding performers in the 2005 U-20 World Cup. His marshalling of the midfield – passing and playbreaking – has been one of the main reasons why Nigeria ended their 19-year wait for the Cup of Nations; his brawn allowing even his midfield colleagues, Sunday Mba and Ogenyi Onazi, to attack without fear. We said before the tournament that the Charles Kabore of Marseille and the Charles Kabore of Burkina Faso are two different animals. 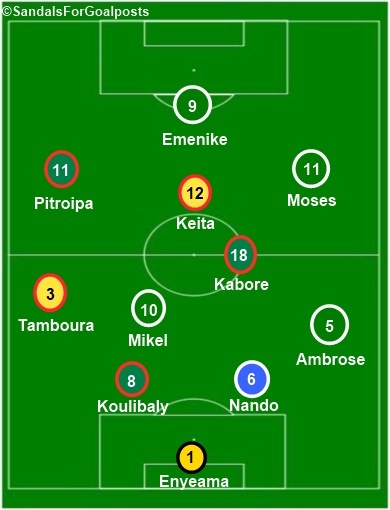 Liberated of his defensive leash, Kabore benefits from the gung-ho double pivot of Florent Rouamba and Djakaridja Kone to unleash his creative license. The effects have been immediate and effective. Kabore led all players with 157 passes completed in opposition territory leading up to the final. He also tacked on a lofted assist and executed cheeky sombreros and flicks, much to our spectatorial delight. It is to be seen if Kabore can bring the same flair to Le Velodrome upon his return. Would Mali have finished 3rd in consecutive Afcons without Keita? Absolutely not. Keita’s performances at this year’s and last year’s Cup of Nations have undoubtedly cemented his place in the principal peloton of Africa’s all-time greats. Last year, playing in a deeper role, he was the metronomic heartbeat of Les Aigles. This year, playing in a more advanced role, he finished the tournament as the 2nd joint top scorer with 3 goals. Timing is everything in football, and each of Keita’s goals was timely – his first, versus Niger in the opening game, came in the 84th minute and proved to be the winner; his second, versus South Africa in the quarter-final, was the equaliser at a crucial stage of the game; and his third, versus Ghana in third place play-off, doubled Mali’s lead in the 48th minute and rendered Ghana’s team-talk to nothingness. Calm, composed and intelligent, he single-handedly drove the team forward; his placidness on the ball was another key factor in Mali pipping DR Congo to the group B runners-up spot. Although he was relatively quiet in the final, probably partly due to only being “80% fit”, Moses constantly tormented defences with his pace, power and trickery from Nigeria’s coming-of-age 2-1 win over Ivory Coast and onwards. His loitering and comfortability either down the flanks or through the centre meant all members of backlines were tested to the brim. He showed great cojones to pick up the ball in the 80th minute against Ethiopia when he was fouled by Alula Girma, then showed the calmness to convert what was arguably a job-saving penalty for coach Stephen Keshi; had he missed, Nigeria would have been on their way out. Trying to contain a wiry dribbler in the mould of Jonathan Pitroipa might be akin to cupping water with your hands. It’s only possible for a few fleeting seconds until he inevitably wriggles through the cracks. Pitroipa’s was CAF’s Player of the Tournament and one would have to rouse all of their observational faculties to argue against that. His link-up play with Alain Traore was a sight to behold in Burkina’s early matches and he was also efficient in front of goal. It did all of us some good seeing one of Africa’s poster boys rewarded for his efforts and we’re sure there’s plenty more to come. Emenike entered the Cup of Nations unknown to the masses, but he swiftly marked his territory. Reminiscent of a young Yakubu, the bullish striker bullied any and all defenders on his way to scooping the Golden Boot. None of his four goals were particularly spectacular, but his trademark determination and grit were apparent in every one of them. Super Eagles fans will rest assured that, in Emenike, they have a striker who will give his all whenever he graces the pitch.